Leading political and religious figures join thousands of other well-wishers at wedding of Rabbi Yitzhak Yosef's youngest daughter. 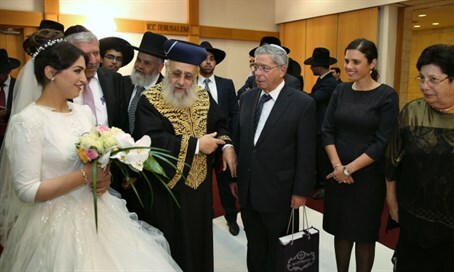 Israel's Sephardic Chief Rabbi Yitzhak Yosef married off his youngest daughter in Jerusalem's Binyanei Hauma Thursday, amid great fanfare and a packed-out hall. Among the many high-profile guests were: President Reuven Rivlin; Supreme Court President Justice Miriam Naor; Knesset Speaker Yuli Edelstein; IDF Chief Rabbi Rafi Peretz; Interior Minister and Shas party leader Aryeh Deri; Justice Minister Ayelet Shaked; Religious Affiars Minister David Azulai; Energy Minister Yuval Steinitz; Minister of Jerusalem Affairs Ze'ev Elkin; and Agriculture Minister Uri Ariel. A number of deputy ministers, MKs and mayors were also present at the joyous celebration, as were leading rabbis including the Shas party's spiritual leader Rabbi Shalom Cohen, who officiated at the wedding ceremony, as well as Rabbi Yosef's predecessor, current Sephardic Chief Rabbi of Jerusalem Rabbi Shlomo Amar, among other prominent Sephardic and Ashkenazic rabbinical figures. Thousands of other people from across the political and religious spectrum also attended the wedding. Sources close to Rabbi Yosef said that for the wider Sephardic community, the immense show of force was proof of Rabbi Yosef's success in continuing the legacy of his father, former Chief Rabbi and Shas founder and spiritual leader Rabbi Ovadia Yosef, who passed away nearly three years ago. "Rabbi Ovadia", as he was often dubbed by his followers, was not only recognized as perhaps the preeminent Torah scholar of his time, but also an extremely popular figure among Israel's large Mizrahi or Sephardic Jewish population.